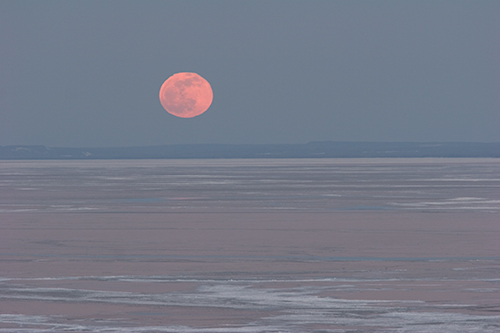 This image of a “harvest moon” rising over the frozen Lake Superior emphasizes the soft pastel colors in the atmosphere just after the sun is no longer visible yet it is catching a high thin layer of clouds and reflecting back to the earth’s surface, in this case, the Lake. I made this image with a Canon 20D camera and Canon 70-200 f2.8 “L” lens with a 2X Canon Extender, of course, off a tripod. The full moon rising just at sunset has to reflect its light to the viewer through more of the earth’s atmosphere than when it is straight over head and the additional atmosphere tends to magnify the size of the moon and substantially warms up the color of the moon as well.